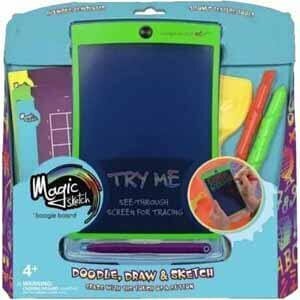 As seen on TV, Boogie board magic sketch lets kids doodle, draw, trace, and play games over and over again! children will be able to write in color on the see-through screen, which is perfect for tracing. Use the Boogie board in place of crayons, markers and paper, Saving money and eliminating wastes and messy situations. With a 7+ year battery life, the no-mess board doesn't require a pesky charging cord, making it ideal for use around the house, in the car, and virtually anywhere else your little one goes. If you have any questions about this product by KENT DISPLAYS, contact us by completing and submitting the form below. If you are looking for a specif part number, please include it with your message.